Heat oven to 450°F. Generously grease 24 small muffin cups, 1 3/4x1 inch. In medium bowl, beat eggs slightly with fork or wire whisk. Beat in flour, milk, sugar and salt just until smooth (do not overbeat). Fill cups about two-thirds full. Bake 5 minutes. Reduce oven temperature to 350°F. Bake about 10 minutes longer or until crusty and golden brown. Cut a small slit in top of each popover. Insert cheese chunk in each popover. Bake 5 minutes. Immediately remove from pans. Serve hot. Add extra flavor to the popovers by stirring in 1/2 teaspoon dried basil or rosemary leaves or 1/4 teaspoon grated lemon peel with the flour, milk, sugar and salt. Bake popovers and cut the slit in top of each. Cool, wrap tightly and freeze. 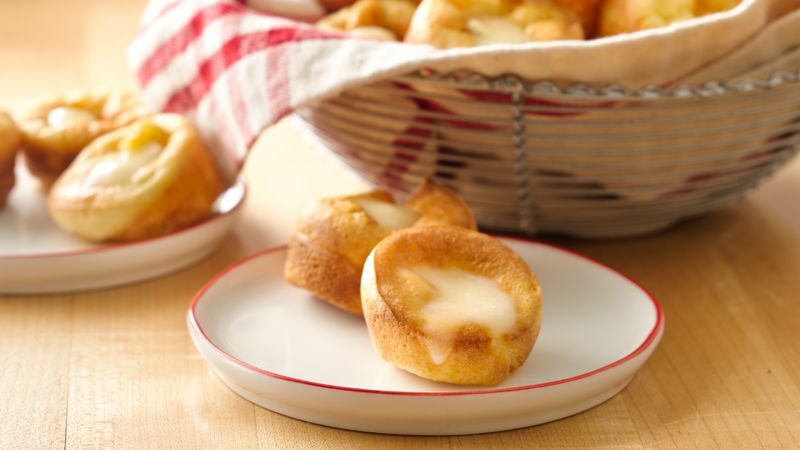 When ready to serve, insert cheese chunk in each frozen popover. Place in muffin cups. Heat in 350°F oven 8 to 10 minutes or until cheese is melted.